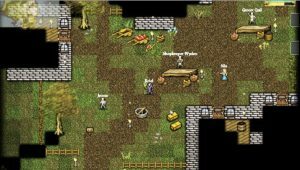 9th Dawn is a huge, old-school style RPG – they compare it to Ultima – set in a vast game world. You play as a single play character, knight, archer or mage. Mage is apparently the easiest: I played as a knight and it’s pretty tough. While this is an extremely enjoyable game, strewn with sidequests and secrets, it’s a also a very hard game, and there are balance issues. Trying to travel onto the next quest area, for example, requires some level grinding just to survive the bears that infest your path. Another issue is the weapons system. This possibly mainly affects knights. Basically the more you use a weapon class the more you progress in it, which enables you to wield more powerful weapons of that class. But it’s slow progress. You’ll be dragging around a better sword for ages, waiting to be able to use it. As such, you’re not going to want to focus on more than one class since you won’t have time to build up your skills in all of them. And this is a bit disappointing when you come across an absolute mega legendary axe but you need to wait for the sword equivalent. Gear is also class based: you’re not allowed to wear mage or archer clothes as a knight, though you’ll find plenty. The final issue with 9th Dawn – and it’s a wonderful game, despite these gripes – is that you don’t get access to a teleport system until after you’ve finished the main quest. With such a huge game world this really needs to be fixed, since even when you can teleport there’s still a long way to travel to dungeons. As a general rule in RPGs, travelling becomes a drag once you’ve thoroughly explored areas. Also to note: even when you have finished the main quest, you’ll still find the ice and fire islands way, way too hard (as a knight anyway). I haven’t yet finished the game as a result because I’ve maxed out my equipment and am not sure I can ever grind high enough to comfortably explore new areas. The great news is that a sequel has been released. The devs are responsive and constantly fixing things, so we can hopefully expect more balance in the second game. It already promises classless character development.